The War Over Confirming Federal Judges Is Heating Up — Again Republican leaders, worried about possibly losing control of the Senate in the November elections, are racing against the clock to push through as many judicial nominations as they can. 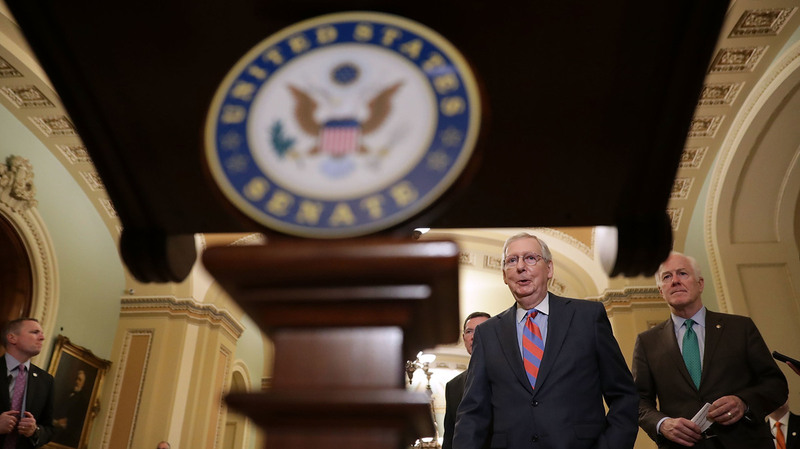 Senate Majority Leader Mitch McConnell, R-Ky., and Senate Majority Whip John Cornyn, R-Texas, (right) prepare to talk to reporters following the weekly Senate Republican policy luncheon at the U.S. Capitol on May 15, 2018. Democrats may hold 49 votes in the Senate but for all practical purposes, they have been completely disarmed when it comes to opposing President Trump's judicial nominees. Now Republican leaders, worried about possibly losing control of the Senate in the November elections, are racing against the clock to push through as many judicial nominations as they can. But even some of their own members are privately worried that abandoning longtime practices and understandings is undermining the Senate's constitutional power to provide its advice and consent on judicial nominations. For most of former President Obama's time in office, the filibuster still existed for judicial nominations, and Republicans used the threat or actuality of the filibuster aggressively to slow down or block Obama's nominations. By late 2013, Democrats were so frustrated that they abolished the filibuster for all judicial nominations except the Supreme Court. Republicans, however, found other ways to block and stall the Democratic president's choices — through other rules and longtime unwritten understandings that the GOP is no longer honoring now that one of their own is president. Senate Majority Leader Mitch McConnell, R-Ky., has made no secret of what he considers his greatest achievement: refusing to even consider Obama's nomination of Judge Merrick Garland to the Supreme Court for nearly a year, and the subsequent confirmation of Trump nominee Neil Gorsuch within the first six months of the new administration. That, of course, included abolishing the filibuster for Supreme Court nominations too. Since then, it's been on to the federal lower courts, where McConnell has made judicial confirmations a number one priority. Tuesday, he ebulliently bragged to reporters that one-eighth of the federal appeals court seats are now occupied by Trump appointees. The mood was quite different in the Senate Judiciary Committee two days later when senators met to vote on six judicial nominations, three of them very controversial. The date was May 17, the 64th anniversary of the Supreme Court's Brown v. Board of Education decision, which declared racial segregation of public schools unconstitutional. On this particular day, it rankled Democrats more than usual that two of the nominees before the Judiciary Committee, following the Trump administration playbook, had refused to say whether the Brown case was correctly decided. That is a marked departure from nominees in previous Republican administrations. Trump nominees, however, have been coached not to respond to questions about their personal beliefs, about concepts of law and about any specific Supreme Court decisions, no matter how historic. "Good lord," exploded Sen. Patrick Leahy, D-Vt. "I'll be darned if I'm going to have someone stand up and say 'I can't tell you if I agree with a Supreme Court decision which is the law of the land." In a scathing tone, Leahy asked, "Is there anybody in this room who wants to repeal Brown v. the Board of Education?" Sen. John Cornyn, R-Texas, objected, noting that all the nominees had said they would follow existing Supreme Court precedents. And Sen. Ted Cruz, R-Texas, added that if a nominee were to answer one such question, that would create a "slippery slope," leading to more questions about other decisions. But Sen. John Kennedy, R-La., who has made no secret of his growing anger over the stonewalling by Trump judicial nominees, wasn't buying it. "I do worry," he said, that "our nominees are so well coached and for whatever reasons are so timid, that they won't discuss the law." And he had a warning for the Trump administration, declaring, "I'm not going to vote for nominees anymore that won't answer my questions." Democrats have complained with increasing fervor about Republicans making it difficult to question nominees by lumping so many of them together in each hearing. They've complained about nominees with strong ideological activist backgrounds on such issues as abortion refusing even to discuss what criteria they would use in deciding whether to recuse themselves from cases. They've complained about the GOP's latest move: refusing to honor the tradition of not moving forward with nominees when both senators from a state object to the nomination. They've complained about changed FBI background check procedures. And they've complained about what they see as an overall ramming through of large numbers of nominees, without giving senators enough time to examine the nominees' records. Indeed, in the first year of the Trump administration, Republicans managed to win confirmation for 12 appeals court nominees, compared to three in the first year of the Obama and Clinton administrations, five in the George H.W. Bush administration, and six in the George W. Bush administration, according to a recent report by the Congressional Research Service. There are, of course, Republican explanations for these disparities — for instance, that President Trump has been more aggressive and prolific than past presidents in making judicial nominations. In the process, the administration has forwarded nominees to the Senate with relatively little substantive vetting. "Those of us on our side have had enough"
But the biggest difference between the Trump nominations and those of previous presidents is that McConnell has made this his number one priority, while in the Obama administration, McConnell, even when in the minority, used every tactic at his command to slow down the confirmation process — tactics that he frequently refuses to allow Democrats to use since Trump took office. This week the ranking Democrat on the Senate Judiciary Committee, California's Dianne Feinstein, who until now has often seemed resigned to losing, threw down a marker at Thursday's hearing where the committee ultimately did not vote on any of the nominees. "Those of us on our side have had enough," she said. "And we're going to begin to be much more active than we have been" about "this effort to stack the circuit courts of the United States." Just how the Democrats will do that is unclear, but not without some Republicans breaking ranks — something that has not happened under McConnell's reign as Senate majority leader. At least not yet.